14 How to Create Meta Tags for SEO | 14 How to create Meta Tags for SEO reveals the important Meta tags for top Google ranking results. 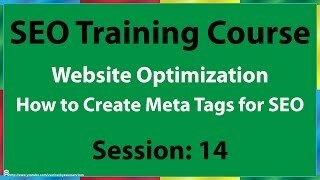 Created by http://goo.gl/V8gG4y search engine optimization consultant this video session explains how to create the perfect Meta description tag and how to utilize Firefox Web Developer Tools to tweak SERP (search engine results page) to see exactly how your web page title and meta description will look in SERP. Web page title and also Meta description elements when crafted intelligently will allow Google to show them in search snippets. If you create your Meta description while describing your landing page content (as in what will your visitors find when they visit you) then Google will more often than not show your version of the web page description. If not created properly, or if Meta descriptions are used just to include keywords and more keywords. Then that will have negative effect and not help your Google rankings at all. There are many other meta tags which can be used for giving user-agents more information about the content of a particular webpage. But most of them are not helpful Google rankings, for example: defining the “meta tag revisit after” will not make Google to obey that rule. Meaning there is no way you can use a meta tag to tell Google when it should crawl your landing pages. Google does that by itself, therefore, although most webmaster use the “meta tag for revisit after directive” it actually doesn’t mean anything for Google, but it does make the size of your landing page unnecessary bigger. In terms of page load times, every bit counts. You may want additionally use the “meta tag for unavailable after directive” this video session outlines how that works.